I love knitting this sock. 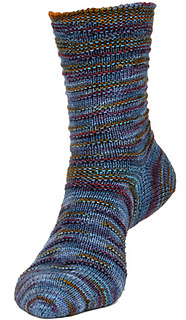 The sample is knit in a denim-blue yarn streaked with other colors. Purling those other colors produces a handsome, cozy texture that makes it hard to stop knitting—you’ll be so eager to see which colors you get to purl next round. You must choose a multi-color yarn for this effect.